While it’s not as well known as more famous ruins like Chichen Itza, the ruined Mayan city of Coba is truly a sight to behold. Home to a range of ruins and carvings which teach us about how the Mayan people lived, it’s been hugely significant for archeologists studying the region. Luckily for you, we regularly run Coba tours from Tulum, and will pick you up to take you on a jungle adventure into the very heart of the Mayan empire! 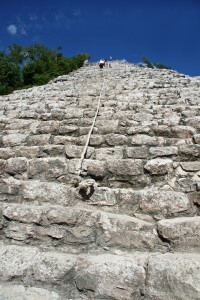 Best of all, though, it’s one of the few places in Mexico where you can still climb the Mayan pyramids for yourself. Looking out over the treetops of the forest, you’ll see why the Mayans felt in touch with the spirits from these peaks- it’s truly an unforgettable sight. There’s plenty to see, and all of our packages include a fully guided tour where you’ll learn all about the Mayan people, as well as some time to explore on your own. Our Coba tours are the perfect way to get an authentic Mayan experience, and see something that many tourists miss out on. Make sure you book your place today! If you spend much time traveling in Yucatan, you’ll notice that lakes are few and far between. That’s why it’s particularly remarkable that there are two located just a stone’s throw away from each other at Coba- likely one of the main reasons why the Mayans chose to build a city here. In fact, the city gets its very name from these lakes- Coba translates as “waters stirred by wind”, a suitably poetic name for such a beautiful place. As you approach Coba through the dense forest, your breath will be taken away by the incredible sight of these historic ruins. Peeking over the treetops, you’ll see a group of ancient stepped pyramids towering over you, before you enter the eerily peaceful ruins themselves. Since Coba tours aren’t as well-known as trips to sites like Chichen Itza, you’ll often find that the ruins here are remarkably quiet, with only a few people wandering through the remains of the pyramids and ruins. 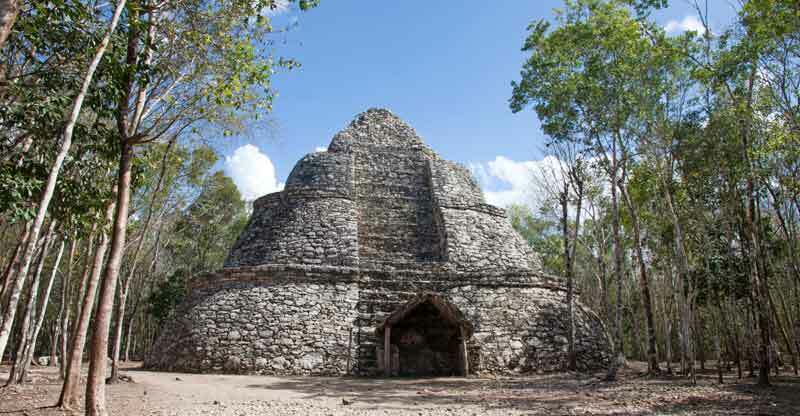 It’s these pyramids which attract most of the visitors to Coba tours. Not only are they magnificent examples of Mayan architecture, but they also display a whole host of carvings, which tell us about what life, and particularly religious life, was like for the Mayan people. Coba also has many features located on platforms, which also boast some impressive artwork. For those who want to see some beautiful ancient artwork, and get up close and personal with the world famous Mayan pyramids, then Coba is one of the best places to come. Not only is Coba home to some spectacular pyramids, but it’s also the best place to see for yourself the ancient Mayan roads, or sacbeob. These roads were used to connect residential areas of the city to the temples and water sources, as well as stretching out to connect multiple cities. There are more sacbeob in Coba than anywhere else in the Mayan empire, and it’s thanks to them that the site was able to be mapped by archeologists. Strangely, we don’t know quite how the Mayans transported things along these roads- while there’s evidence they knew about the wheel, there’s actually no record of them ever using it. In the early days of the Mayan empire, Coba would have controlled vast swathes of land, covering the east of Yucatan and the north of Quintana Roo. While little of the city remains today, you can feel the centuries of history flowing in the very soil here. All around you are remnant of a past that is still being studied, so who knows- you could uncover something that shines a whole new light on the Mayan civilization! What we do know about Coba is that it was significant in the past, and it’s still significant today- the pyramids here have a lot to teach us, and it’s likely that many new discoveries will be made here in years to come. 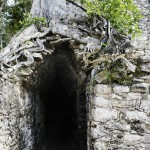 It was only recently that Coba came to the attention of archeologists, though. Much of the site is yet to be uncovered, and an incredible 5,000 mounds remain unexplored. This helps give the site a real “jungle temple” feel, with the trees still growing on some of the pyramids. If you’ve ever wanted to feel like Indiana Jones uncovering an ancient city, then our Coba tours are definitely the thing for you! 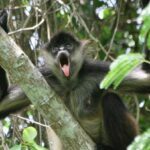 Since there aren’t as many tourists here as at the bigger, more well known ruins, Coba is also a prime spot to see all sorts of native wildlife around you, from birds to monkeys swinging through the trees. 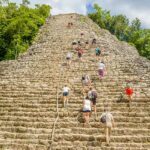 The biggest advantage of Coba being less visited by tourists, though, is the fact that you can actually climb the pyramids for yourself. In more popular ruins, the authorities have banned the public from climbing pyramids for fear that they could fall and hurt themselves. For the time being, though, there are no such regulations at Coba. This is a unique opportunity to scale the pyramids, or Nohoc Mul as the Mayans called them, including the centerpiece, the magnificent 42-meter high pyramid Ixmoja. It’s quite a climb, but so rewarding when you get to the top. You’ll be able to gaze out over the treetops of the forest, and get a sense of just why the Mayans felt a spiritual connection to the gods from up here. At Wonderous World, we’re delighted to arrange tours to this little-known gem of the Mayan empire, and provide them with their very own jungle adventure. Every tour starts with you being picked up from your hotel in our comfy, air-conditioned bus, and then whisked away on our Coba tour from Tulum. While Coba is the centerpiece of our tours, many of them also include trips to cenotes, or sinkholes, where you’ll be able to try your hand at cave diving, and cool off after a hot day. The Mayans used to visit cenotes for religious ceremonies, but nowadays, they’re all about having an aquatic adventure! With ziplines over the water and treetops, this is an experience you’ll never forget. Other Coba tours from Tulum that we offer also take in the nearby Mayan ruins of Tulum, the only known port city of the Mayan empire. Next to the sandy shores and clear blue sea lie many remnants of a once-mighty city, including a temple with some breathtaking artwork on display. Like Coba, the Tulum ruins are yet to be fully understood, but they are an equally beautiful place to visit and soak up some authentic Mayan atmosphere. So, if you want to go on an adventure that you’ll never forget, and delve into the heart of the Mexican forests to climb the hidden pyramids, then make sure you book your place on one of our fantastic Coba tours today. It’s the experience of a lifetime! 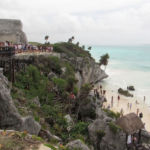 Also don´t forget, we offer the largest selection of Tulum Tours at discount pricing so look around and make sure to do the ones that excite you the most. If you like the idea of the cenotes you may want to look at our Tulum cenote tours section. 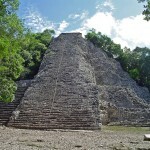 Another section to consider is our Chichen Itza tours from Tulum. If you have any questions about this or other tours feel free to contact us at any time, and we will see you in Mexico!